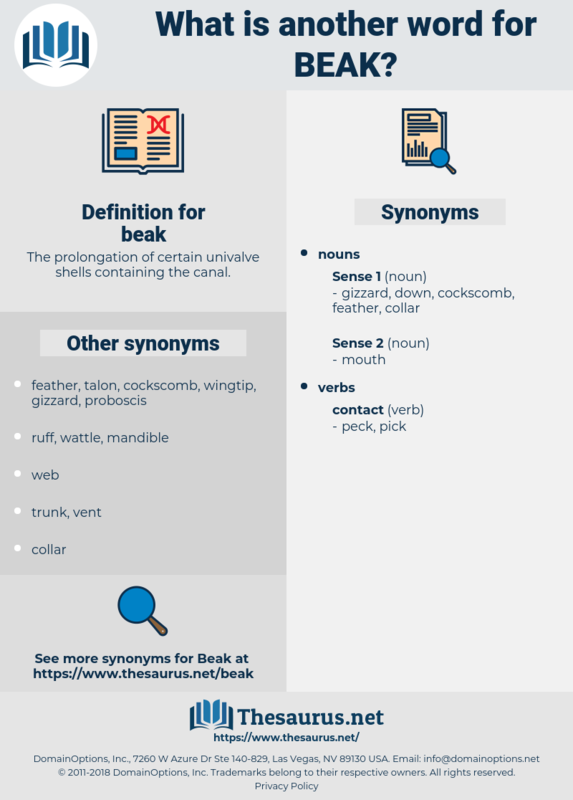 What is another word for beak? 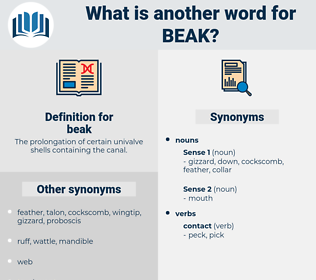 Felix's books supplied no answers to these questions, but they were comforting; for her real need as yet was not for answers, but ever for more questions, as a young bird's need is for opening its beak without quite knowing what is coming out or going in. Hardly had his mother left when his comical head, with thick, blunt beak and large intelligent eyes, appeared over the rim of the nest. buxaceae, big, bookie, box, boogie, bacca, bakehouse, bosc, buckeye, bush, bogy, boccaccio, bocci, beg, basso, bake, beach, befog, bigwig, basis, Bok Choy, bauhaus, baisa, buggy, babyish, bivouac, biface, bouchee, back, boise, biopsy, beefcake, beck, bushy, bash, bs, backache, basics, babassu, bioko, bacchic, bishkek, bakshish, buzz saw, b.c., beachy, buzz, bezique, bias, bouse, beige, bossy, bog, bosch, bogey, bisayas, boxy, big H, bookcase, beach house, bowse, beseech, bize, baggage, bug, biskek, bozo, Bayes, bushwhack, bisque, bos, bee house, buyback, bioassay, boche, bike, back away, bibos, biz, bask, baccy, bagassosis, bass, BCE, bag, baku, bissau, boyish, bucksaw, back saw, bach, Bosk, buckshee, buck, Bokkos, bijou, bypass, basque, bose, Bok Choi, bosh, bosky, bakshis, baize, big cheese, bse, basuco, bogus, bahasa, baic, backsaw, biggish, bise, book, busy, bagascosis, bk, baisakh, bock, bps, bio-assay, besseya, backhoe, backsheesh, bazooka, booze, baggy, bacchus, bogie, bobbysock, bbs, babushka, buss, baksheesh, baby shoe, basia, Bay Of Biscay, boccie, buxus, boggy, biophysics, bagasse, bocce, boozy, bigos, bigeye, bosie, bus, base, BC, bhaga, beeswax, buy back, bookish, baby-wise, by choice, BJS, backwash, BJA, basic, besiege, boogie-woogie, beek, baek, beech, be sick, booboisie, bough, babka, boss, beeck, baby buggy, b.c.e., byssus, baiza, bassia, baas, bobbysocks.